Home > News > News > The 2017 demos have arrived! The 2017 demos have arrived! Volkswagen was originally founded in 1937 and has since earned the title of one of the largest automobile manufacturers in the world with a market share over 20 percent. With numbers like that, it's no surprise Volkswagen has the right model to suit your exceptional lifestyle! So whether you're looking to buy, sell, lease, or trade, Volkswagen has the best offers and incentives! 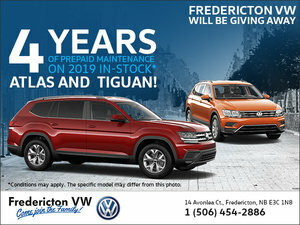 This summer at Fredericton VW, we offer incredible savings on all the Volkswagen models you know and love. These demonstrators all have extremely low mileage while being offered with enormous discounts! It's like buying a new car at the price of a pre-owned. We have a limited stock of Golf models, Golf Alltrack, Jetta, Passat, Beetle, Tiguan and Touareg, so no matter which type of vehicle you prefer, we have something for you. Be quick, our 2017 Volkswagen demo models won't stay in the lot much longer! When we engineered the 2016 Golf GTI, we pulled out all the stops. With its sporty performance and tight handling, you'll be hard pressed to find a hatchback that's this much fun. Excitement called, and we answered. We've engineered the 2.0 TSI® engine to inject fuel precisely for maximum efficiency. The result is maximum performance. The 2017 Jetta is our most innovative Jetta yet. The engine is incredibly fuel-efficient. It's loaded with great features. And you'll find precise German craftsmanship everywhere you look. With an available 6-speed automatic transmission and turbocharged engine, it's the most fun you're legally allowed to have while sitting down. We designed the new 2017 Passat to be better than most. With premium quality and craftsmanship in every refined detail, you'll find the little things make a big difference. The new 2017 Passat combines a sophisticated, professional aesthetic with practical flexibility. It's the perfect ride for business 9 to 5 and family 24/7. Look up, waaaaay up. Because with the top down, there's nothing but sunny skies and starry nights to enjoy. It's impossible not to be in a happy mood driving this car. Make your mark in the world behind the wheel of a cultural icon that also lets you enjoy a big breath of fresh air, without the big price tag. Hurry! Book your test drive today!